As we continue to honor Mahavir Janma Kalyanak, we would like to share with you with an article below as well as an invitation to participate in our "21 Day 'Live and Help Live' Challenge" from May 5 - 26 to deepen your practice of kindness. One way to contribute to JAINA's "Nepal Earthquake Relief Fund" who's efforts are led by the World Community Services Committee. We have a number of academic and financial aid opportunities for our Jain high school, undergraduate, and graduate students. Lastly, you will be heartened to read about our new initiatives to support our community and strengthen our ties abroad. I. CELEBRATE "LIVE AND HELP LIVE" & JOIN OUR "21 Day 'Live and Help Live' Challenge"
To live and let other’s live is an exercise in tolerance. It means that we let people live and act regardless of whether or not we agree. For instance, while we may believe that having a certain lifestyle is important, we may be tolerant of someone who has a different lifestyle. To take this a step further, we may see the painful experience of another (perhaps on TV) and empathize with their pain momentarily. The moment soon passes and we are onto the next scene. To Live and Help Live, however, is the practice of expressing the experience of empathy into action due to a deeper experience of inter-connectedness of life. If someone lost their job and couldn’t pay rent, you may invite them into your home until they got back on their feet again. If you were driving and saw someone with a flat tire on the side of the road, you may pull over and provide support (be it change the tire, call for support, wait with them until help arrives, any other ways to help relieve their suffering). You would help! COMPASSION IS A MUSCLE, LET’S BUILD IT TOGETHER! to share your experiences and inspired by each others' posts. The under-privileged nation of Nepal was faced with destruction and devastation, earlier this week. 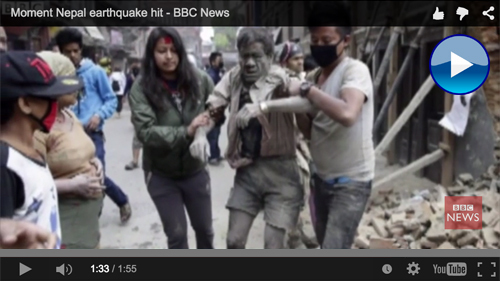 On April 25th, a 7.8 magnitude earthquake struck an area between Kathmandu, and the city of Pokhara in Nepal. More than 2,300 people were killed in that what is being considered the worst earthquake in 80 years. JAINA World Community Service (WCS) is launching a fund for the victims of this unfathomable tragedy and ask the Jains of North America to contribute. The funds will be used for a humanitarian project that will be selected & executed against once the relief operations ends and rehabilitation work begins. III. 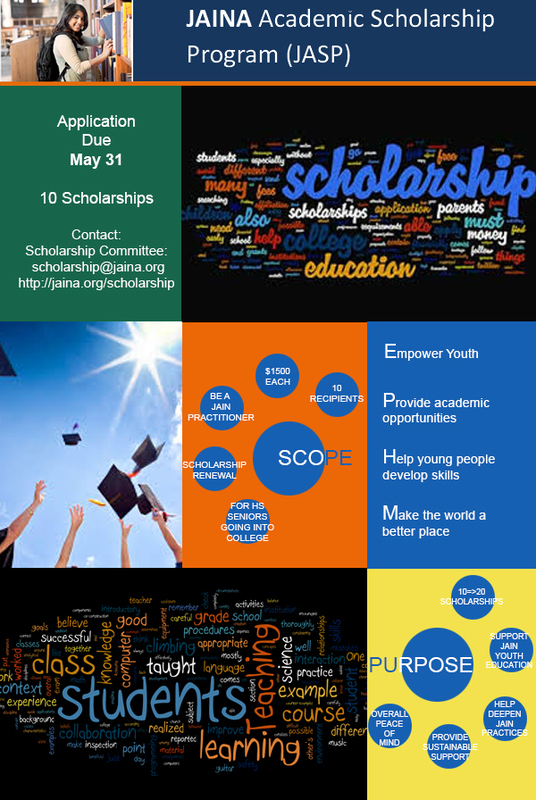 GREAT SUMMER OPPORTUNITIES FOR YOUTH & YOUNG ADULTS! RATE INCREASE ANNOUNCEMENT CALL FOR PANELISTS! Questions? Contact Pravinbhai Shah at jainaedu@gmail.com or (919) 859-4994. We look forward to seeing you at JAINA Convention 2015! Are you passionate about making a difference for the Jain community? Would you like to learn and develop new skills while doing so? Are you a leader who enjoys collaborating with other leaders? Then join the JAINA Volunteer Corps (JVC) today! We have just launched this new program for those who would like to contribute to the greater good of the Jain community and beyond. NOTE: This opportunity is currently only available to those in North America. I. YJP celebrates Mahavir Janma Kalyanak at various Jain Centers. Young Jain Professionals (YJP) celebrated Mahavir Janma Kalyanak (also known as Mahavir Jayanti) with Jain Centers all across the country this past month! In Southern California, YJP volunteered to serve over 1,000+ attendees at the Jain Center of Southern California's Mahavir Janam Kalnayak celebrations. In New York, YJP was represented at a YJP booth with the Jain Center of America which attended by Jains families from around the Tri-State area attend to celebrate the religious festivities and cultural programs. In Raleigh, YJP performed a Jain Stavan and volunteered to host the Jain Study Center of North Carolina's largest annual event. Additionally, 1000+ people globally viewed Young Jain Professional's social media updates sharing the meaning and history of the reason Jain's celebrate Mahavir Janma Kalyanak each year. We'll be brunching afterward at Real Food Daily from 12pm - 1:30pm. (516 Santa Monica Blvd, Santa Monica, CA) Click here for more details. I. Upcoming YJA Gatherings + YJA Blankets for Sale $10! 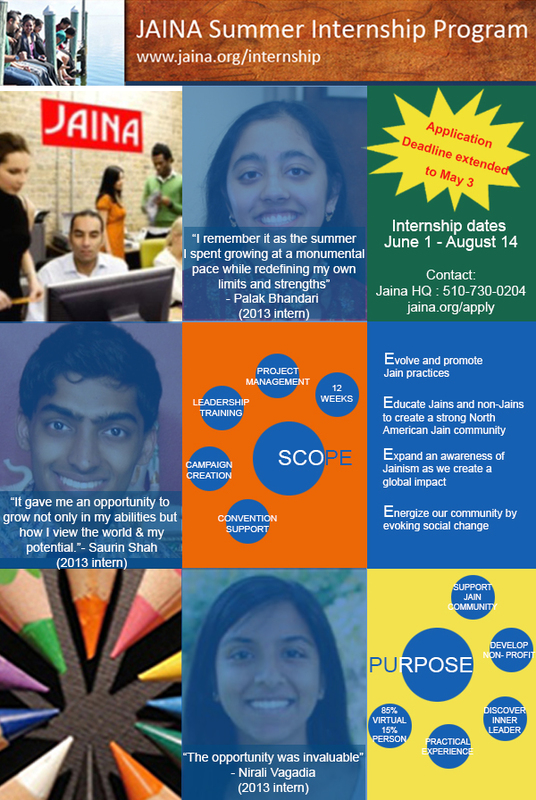 JAINA is proud to announce our Jain International Youth Exchange Program! JAINA has partnered with the Jain International Trade Organization (JITO) to send 10 Jain students from India (ages 18 - 25) to the US this summer from mid June to mid July. They will be also attending the JAINA Convention and engage in a program which provides exposure to the ways Jainism is practiced in the North America, as well as exchange perspectives with North American youth & young adults. JAINA plans to send 10 youth this winter in exchange. More details to come! JAINA is also in the process of putting together the "JAINA Education Loan Program" (JELP), which aims to provide interest free loans to students to assist in defraying their cost of education. For 2015, the JELP team anticipates providing loans for up to 5 recipients at an amount of $3,000 per recipient. More details to come! III. FIU launches Online Lecture Series on Jain Texts by Jain Scholars starting May 9! The Jain Studies Program at Florida International University (FIU) welcomes you to the inauguration of the Online Lecture Series on Jain Texts. This program is launched to enrich textual studies in Jainism and nurture the study of ancient languages like Sanskrit, Prakrit, Apabramsa, and other Indic languages. This will promote, rejuvenate and invigorate scholarship and research on primary sources. Scholars will present their research on a chosen Jain text through interactive video conferencing. Click here for details. If you would like to stop receiving communications from Jaina.org, please click on this link and add your email to our opt out list. This will ensure that you will no longer receive emails from Jaina.org. Opt Out Link - https://jaina.site-ym.com/general/opt.asp Contact Us - https://jaina.site-ym.com/general/?type=CONTACT. This email was sent to '@@email@@' from JAINA-JainLink. If you wish to stop receiving email from us, you can simply remove yourself by visiting: @@unsubscribe_url@@.